catnip and tulsi herbs, and more! Email me at gardens@wncmretc.com or call 828.333.4151 with the name of the varieties and number of plants you'd like, and I'll put the plants aside for you. M R Garden's Plant Wagon, Onteora Blvd. in Oakley: 10:00-2:00p.m. Saturdays May 3 through May 24 or as long as I have plants available. Thanks to those who participated in Pre-Season Prep. Your plants are almost ready and I'll be getting in touch with you very soon to schedule a pick-up date before Mother's Day (May 11). I typically like to plant my tomatoes once the Weather Channel is no longer predicting lows in the 40's in its 10-day forecast. As of right now, that could be as soon as Monday (May 5). I'm so pleased at the high return rate of Pre-Season requests year after year, and I'm also glad that a handful of new participants are willing to give this service a try each season. Your involvement is crucial to the success of the nursery. It helps me a great deal to know which plants you need before I seed them, and I hope it encourages you to do pre-season planning, which should add some ease to your life come planting time. You've helped a local business build a solid foundation since 2011, setting up M R Gardens for returns in the long-term, which subsequently means gains for our community, our landscapes and our health. I heard something interesting at the Mother Earth News Fair at the WNC Agricultural Center in mid-April. 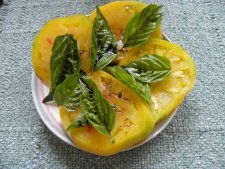 According to workshop speaker Jere Gettle, founder of Baker Creek Heirloom Seeds, lab tests have shown that dark-colored and yellow tomatoes, have more nutritional value than the typical store-bought tomatoes. He says that these heirlooms have the ability to take up a greater quantity nutrients from the soil. Gettle has collected ancient heirloom seeds preserved in indigenous communities in the far corners of the world. Since these varieties have evolved with the ecosystem over time, they have superior pest resistance. We typically don't associate pest and disease resistance with heirlooms, but in fact they do exist as the original seed collectors selected the plants that did the best despite any challenges. In fact, I'm growing an heirloom variety that West Virginia University Professor Emeritus Mannon Gallegly, now in his 90's, saved year after year due to its good blight resistance: West Virginia 63. I still have a few of these plants left if you'd like to try them. Read more about the differences between heirlooms, open-pollinated varieties and hybrids, which each have their benefits, on my website. My diet becomes more and more diverse as I try unique and lesser-known edibles. When I worked at a Community Supported Agriculture farm for the first time in 2003, I had barely even heard of some of the vegetables we were growing, such as kale, pac choi, celeriac and parsnips. Since then, they have become staples in my diet. I continue to try growing several vegetables new to my pallet each year. This growing season, I'm adding sorrel, radicchio, and ground cherries to my garden, as well as an oldie but goodie: Brussels sprouts. 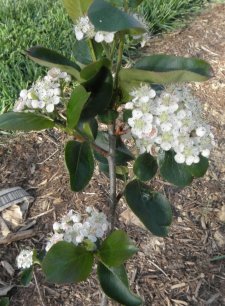 I've also planted several trees that will further diversify my diet in years to come: aronia (flower pictured above), serviceberry, elderberry, goumi, paw paw, American plum and persimmons. Most of these edibles also have medicinal qualities as well! Nutritionists are continually talking about the benefits of a diverse diet full of vegetables and fruits of all sorts of colors. As my landscape's health improves, so does my own.